Hey everyone. Continuing to my skin care related entries, I'm sharing some of the products I've been using lately. I have to be thankful that I don't have major issues with my skin. For one, I don't have (yet) any visible wrinkles and lines on my face. Also, my skin is not very sensitive so I'm able to switch and try out products without it reacting badly. Lastly, except for the occasional hormonal breakouts and some visible pores, my skin is quite blemish-free. As I have reached my thirties, I have noticed that my skin needs steadfast skin care. When I was in my twenties, just using a cleanser and moisturizer sufficed. Now that I'm older, my skin readily looks dull and sallow if I skip my routine for a day or two. Keeping it clear and smooth requires regular cleansing, moisturizing, and actively staying out of the sun. A good brightening serum on top of moisturizer will help combat the dullness and loss of radiance in the skin. I have been alternating between my Olay Regenerist Essence and L'oreal White Perfect Essence for this purpose. A few weeks ago, I also picked up a newly released product from SK-II (bought from Sephora Ph.) I have been using SK-II Genoptics Aura Essence for more than two weeks now so I'm ready to share my experience with you. - This lightweight, milky essence spreads easily and can be quickly absorbed by skin. - Engineered with breakthrough Aura Complex and infused with PITERA to bring out your spot-less aura from within. - With a new, specially designed auto-fill dropper, one full drop will provide the optimal dosage for best results. How to Use: Pump the dropper once into the palm of your hand to get the optimal dosage for one-time use. Smooth evenly over face. *Apply extra Essence on concerned areas. Ingredients: Genoptics Aura Complex - a fusion of next-generation ingredients designed to unleash your spot-less aura from within. - PITERA (TM) : A concentrated formula full of vitamins, amino acids, minerals and organic acids. - Prunus Extract : Extracted from prune fruits, containing antioxidants, vitamins and minerals to prevent oxidation stress. - Insitol: Promotes lysosome activity for increased skin clarity. 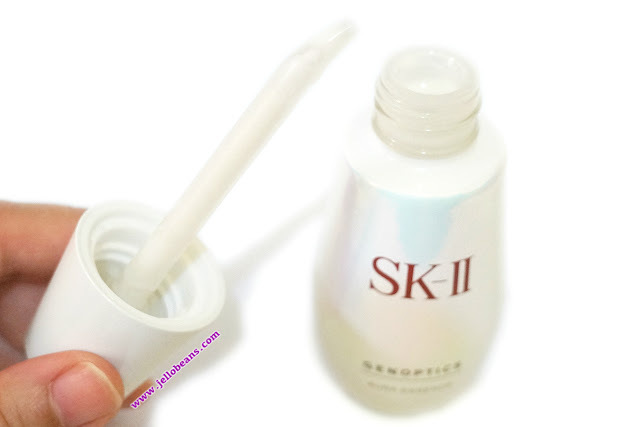 ***NOTE: The new SK-II GenOptics Series will replace the Whitening Power Spots Specialist and Cellumination Aura Essence — to fight hidden spots and clouds before they surface. 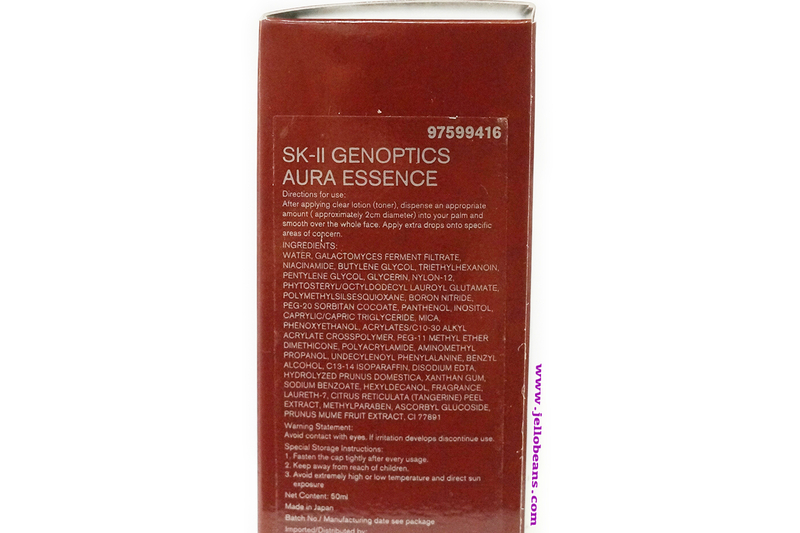 This serum comes packaged in a shiny reddish cardboard box. The (50ml) white bottle container itself is made of glass, feels heavy and looks opulent. You open the cap by twisting it. The dropper attached to the cap is plastic and bent at the end. I only needed a couple of drops to cover my whole face. The milky essence has a runny formula but not as watery as I expected it to be. My skin readily absorbed the product. It instantly moisturized and brightened my skin. I looked less tired, with my skin looking vibrant and less dull. The essence spreads on the skin very smoothly. The formula is still lightweight yet not too thin that you don't feel anything. I certainly sense the product being absorbed and nourishing my skin. I like how my skin feels and looks supple and soft after application. I can also see the effect and difference it makes every morning when I wake up. After almost three weeks, my skin looks noticeably smoother. My overall complexion is more radiant and my skin tone more even. My small blemishes and pimple spots are also fading and getting less noticeable. The essence is even nourishing and moisturizing enough that I sometimes skip my regular moisturizer. I am liking how my skin looks and feels after every application. The only drawback to this wonderful product is how expensive it is. I got this one on a great discount from Sephora Ph but this actually retails SGD 299 (around Php 10,000). I feel that I could get similar results from other less expensive products (Missha's time Revolution line comes to mind).